Heirloom tomatoes, amongst other things, are an unadulterated sweetness of summer. They have a deep dramatic flavor and a soft flesh that melts in your mouth, tempting you to believe they are indeed some fruit. 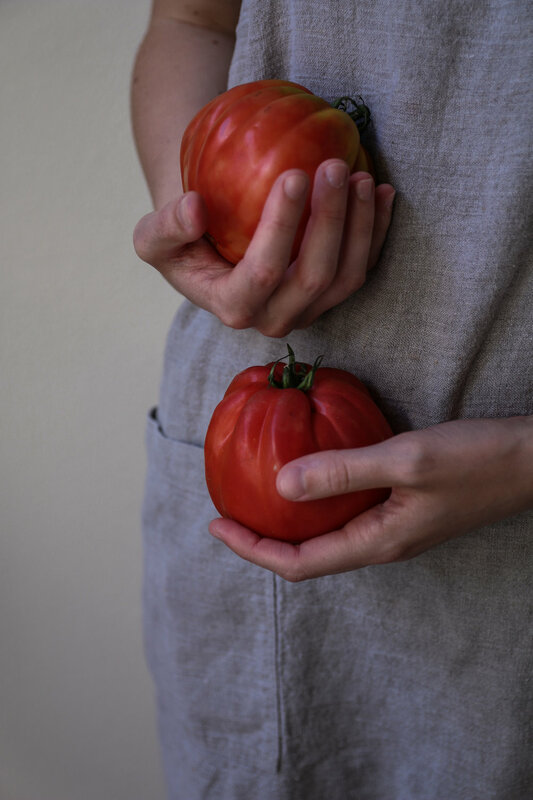 When ripened on the vine and gathered at the farmer's market, they are truly something so very different from the grainy, tasteless supermarket tomatoes shipped from miles away. These are deserving of being eaten raw, really not needing much of anything to help their flavor along. After bringing home a tote full of these tomatoes from the market on a searing hot Saturday, I conjured up a recipe that would preserve their perfect raw flavor instead of changing it by heating, adding sliced pieces at the very end of cooking pasta instead of turning them into a bubbling stovetop sauce. I think the addition of fresh tomatoes and basil, cool from being nestled in a shaded countertop corner and touched by no heated pan, helps make a dish of just-boiled pasta not quite as overwhelmingly warm for a hot summer's supper. Eating fresh pasta made by your own hand is nothing short of satisfying. When I first started making pasta at home, I was surprised at how simple it is: combine the humblest of ingredients, eggs and flour, and you have pasta. There are pasta machines that feature a hand crank, pasta attachments for stand mixers, and electric ones that perform their task very quickly. It may be an investment, but if you love pasta and are intrigued by making it at home, it's worth it. I use this machine for making pasta, but with a bit of elbow grease and a steady hand, you can make it without a machine. Roll the divided dough very thinly, and slice thin strips with a pastry cutter - I promise it will be worth your while. Of course, store-bought fettuccine pasta will work beautifully in this recipe if you so choose and make for an easy, quick meal for a weeknight. When heating the sliced garlic in the salted butter, watch its color carefully. When the butter is bubbling and just before the garlic browns, quickly take it off the heat so as to not risk burning it and spoon over the pasta. This quick toast helps to mellow the garlic's potency just slightly and flavors the butter, destined for drizzling over fresh fettuccine. A quick addition of shaved parmigiano-reggiano at the end is encouraged! Measure the flour and pour into a bowl, then make a well in the middle for the eggs. Add the eggs, then use a fork to gently whisk them. Once whisked, gradually introduce flour to the whisked eggs with the fork while stirring. 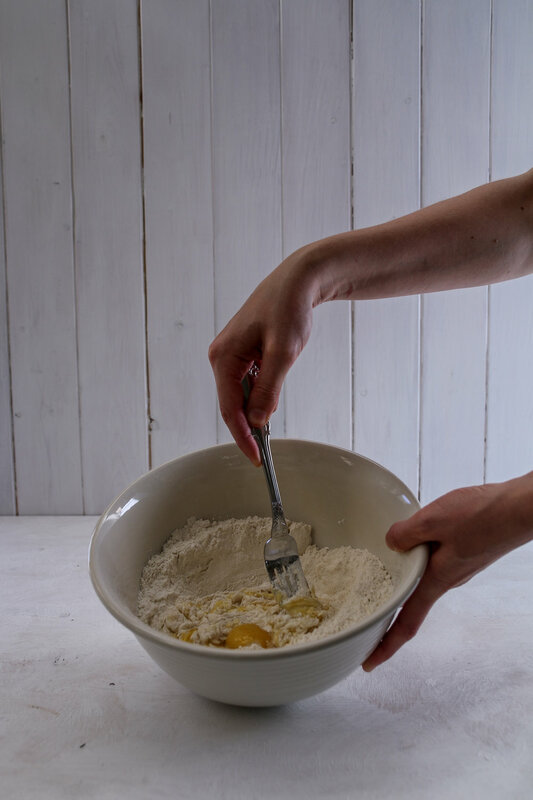 Once enough flour has been combined, set the fork aside, and knead the dough. Add water, 1/2 tablespoon at a time, until the dough is no longer dry but not yet sticky (if it's sticky, you can add a bit more flour). Alternatively, use a food processor to combine the eggs and flour, adding the eggs one at a time and then the water, pulsing the machine until it forms into a ball. Knead the pasta dough about two minutes, then cover with plastic wrap and rest the dough for 15 minutes at the least. This will keep the dough from tensing up as you try to roll it out. While you're waiting, fill a large pot with water and a generous helping of salt, and place it over high heat to bring it to a boil. While the water is heating and after the dough has rested, divide the dough into eight pieces. 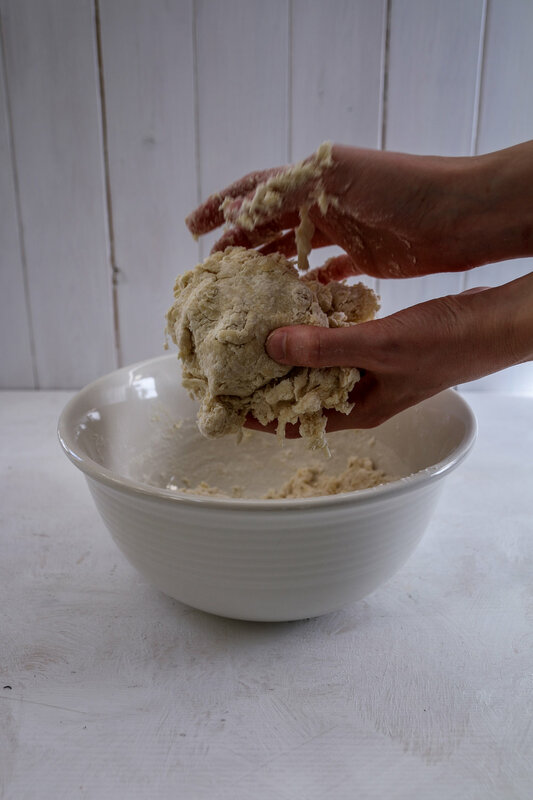 Using a pasta machine, feed a piece at a time through the roller set at the widest position, dusting generously with flour so as to help the dough not stick. Roll the dough thinner and thinner by adjusting the rollers to the next narrow setting each time. Keep going until the pasta is quite thin, to where you can just see your hand through it. Repeat with the rest of the dough, then place on parchment paper with a generous amount of flour in between if they are resting on top of one another, or side by side. Using a fettuccine cutting attachment on the machine, run the sheets of pasta through one by one, tossing with more flour (or semolina, if you have some on hand) once they are cut into noodles to be sure that they don't stick together. Place gently back on parchment, repeat with each sheet, and by now the water should be boiling. Place the fettuccine in the boiling water. It will cook fast, as it is fresh, needing only about a minute or so. Drain the pasta, being sure to reserve 1/3 cup of the cooking water to add later. Toss the freshly cooked pasta with a generous few glugs of good olive oil. Add the sliced tomatoes, ribbons of basil, a good amount of grated parmigiano, and a bit of pepper. Taste before adding salt, as the pasta should have absorbed some of the salt in the cooking water. Add the 1/3 cup of cooking water, and toss. Over medium low heat, melt the salted butter and add the sliced garlic, stirring until the butter just begins to bubble. Take off the heat before the garlic begins to brown, and pour over the pasta. Serve with an extra bit of grated cheese on top.